Indy Pro Showcase2626 West Sam Houston Pkwy NHouston, TX 77043 start time at 8am. 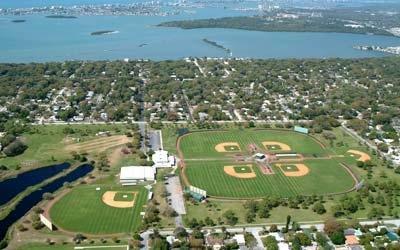 The post draft showcase of 2019 showcase will be held June 26-27 at the Walter Fuller Complex in Saint Petersburg, Florida located at 7901 30th Ave North, Saint Petersburg, Fl 33710. Don’t delay as last year’s camp was sold out weeks before. 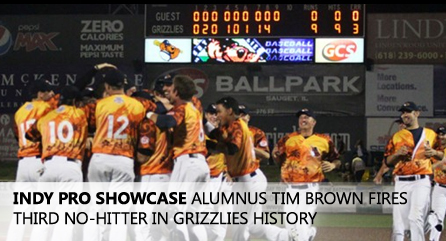 ” We have players from our 2018 showcase’s doing great things already in pro ball. They just needed a chance to be seen. 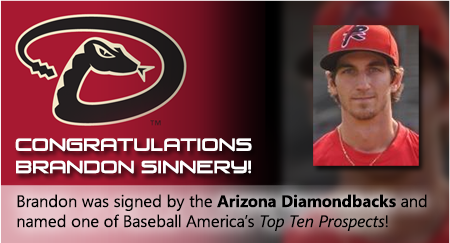 We have had players go on to have All Star minor league seasons each year with many making Baseball America’s Top Indy Prospect list….the DBacks signed Louisiana Lafayette’s Joe Robbins who we got a job for last year at the June St Petersburg Camp. It’s a way for the overlooked player in the draft to get a contract on the spot and start their pro career immediately”, said IPS founder, Nick Belmonte. “We can’t wait to get back there and help these kids that don’t get drafted. 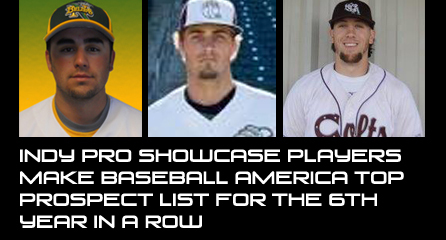 We traditionally get deserving players from this showcase on one of the many Indy Leagues that are already in season, including Brandon Cummins who came to our Indy Pro Showcase last year in California got a job playing in the Cub’s organization”. Just below on this page are just some of the players we got jobs for in the last few weeks that are thriving already in pro ball. Just like you, they just needed a chance. The showcase cost is $250 till through June 25th. Pro Scouts from the major league organizations such as the Rays, DBacks, Cardinals, and Cubs will be in attendance. Limited space for this camp so sign up early. LINCOLN, NE – The Lincoln Saltdogs and the American Association jointly announced today that the Arizona Diamondbacks purchased the contract of Joe Robbins. Robbins was discovered by Indy Pro Showcase director Nick Belmonte at their June Showcase in Florida. The Saltdogs signed Robbins to his first professional contract on July 4th. The 23-year-old made an immediate impact for the Saltdogs. He hit .302 with seven home runs and 23 RBIs over 49 regular season games. He used his speed to get 12 doubles, four triples and an inside-the-park home run in addition to eight stolen bases. Robbins had an explosive series in the playoffs. He hit .375 with three home runs, a double and five RBIs over a four game stretch against the Winnipeg Goldeyes. The rookie’s best game came against the Sioux City Explorers on August 10th. He hit for the cycle and notched five hits to tie the franchise record for hits in a game. He was the first Saltdogs player to hit for the cycle since Pichi Balet did it in 2006. Robbins’ improved throughout the second half of the season. He hit nine homers over his final 28 games after getting just the inside-the-park homer in his first 25 contests. He finished the season on a six game hitting streak. He hit just .250 in his first 12 games before bursting out to complete the regular season and postseason hitting .372. Robbins also proved his value by being versatile. He played six different positions for Bobby Brown’s team, spending most of his time at third base and center field. He made just two errors in his 53 total games. Just Remember …The Saltdogs discovered Robbins at the Indy Pro Showcase. Less than 4 weeks after the June 27, 2017 Indy Pro Showcase players have not only gotten pro jobs already, they are flourishing. Joe Robbins from Louisiana Lafayette is hitting .333 in his first 50 pro ab’s for Lincoln of the AA (American Association). On July 21st Robbins got 3 hits and knocked in the tying run in the 9th as Lincoln beat Wichita. Romeo Cortina outfielder from St Edwards U got a base hit in his first start for Southern Illinois in the Frontier League and just hit 2 hr’s in one game on July 19. Cortina as of July 27 he has 10 rbi’s in his first 11 pro games and is hitting .302 . Hunter Courson from St Edwards U(D2) hit his first homerun in only his second game and for Cleburne in the AA. RHP Kevin Hilton Cal St San Marcos (who has not pitched in 3 years) has has been stellar in his first 5 appearances for the Texas Airhogs in the AA and has an ERA of 1.28. RHP Adam Eggnatz has been outstanding in his first 7 appearances for Ottawa in the Can Am League with a 0.90 era. Chris Barr from the U got his first start on July 18 for the Gary Southshore Railcats of the AA. Kennard McDowell shortstop from UNCW just got offered a contract from the Rockies. RHP Dominic Reed will be signing this weekend with Traverse City…More signings to come. Go get’em guys ! Already June 27th Indy Pro Showcase players getting headlines. July 11, 2017… Joe Robbins now a member of the Lincoln Saltdogs had his first hit, a three-RBI triple, against the Cleburne Railroaders on Saturday. Robbins kept his hot bat going, tying Tuesday’s contest with a two-run home run, along with his second triple in the last 3 games and now has 4 hits in his last 6 ab’s…. July 15…Joe Robbins hit his 3rd triple tonight in just his 9th game he started. That now leads the Saltdogs in triples and he ranks 3rd in the American Association in that category. The American Association teams have all played 53 games which makes that feat amazing. Just 3 weeks after attending the Indy Pro Showcase June 27, Southern Illinois Miners got two home runs off the bat of rookie outfielder Romeo Cortina to help mount a comeback on Wednesday night July 19th against the Washington Wild Things and added three more hits including a triple on Thursday July 20th. Josh Blanco Signs with the TexasRangers… April 23rd, 2016, the OTTAWA CHAMPIONS lost a key component of their bullpen as the TEXAS RANGERS have purchased the rights to ” 2015 Indy Pro Showcase participant” JOSH BLANCO and signed him to a two-year minor league contract.“I hadn’t pitched in four years and the Indy Pro Showcase gave me a chance”. “This is why you come to the showcase”, said IPS Co Founder Nick Belmonte. “He hadn’t pitched in a while but even at 25 years old, we believed in him as soon as we saw him” Belmonte added. BLANCO, now 26, appeared in 33 games for Ottawa in 2015, compiling a 3-2 record with a 2.45 ERA and 43 strikeouts in 44 innings pitched. “He took the opportunity we gave him and ran with it. He deserves this !”, said IPS Co Founder Dave Marcon. 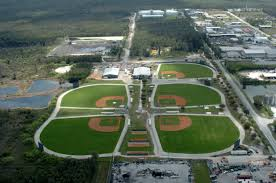 The Indy Pro Showcase is once again excited to have their “Post Draft” showcase in St. Petersburg, Florida, at the Walter Fuller Baseball Complex(7901 30th Ave N, St Petersburg, Fl 33710). This showcase for years has proven to be the most successful showcase as the talented players not drafted in the MLB draft will be able to still start their pro careers via Independent League baseball. “We send players from this showcase right to the Indy teams in the middle of their season and they have produced every year”, said Nick Belmonte, co-Founder of IPS. “We had Baseball America’s top Indy Prospect last year in Eric Anderson. 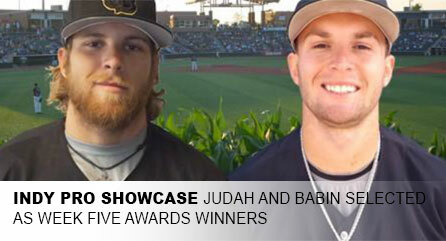 That was the 3rd time Baseball America has bestowed that honor to one of our showcase players. We have also had affiliates sign players right at our showcase as well”, he added. Space is limited so please fill out the registration form and reserve a spot now! 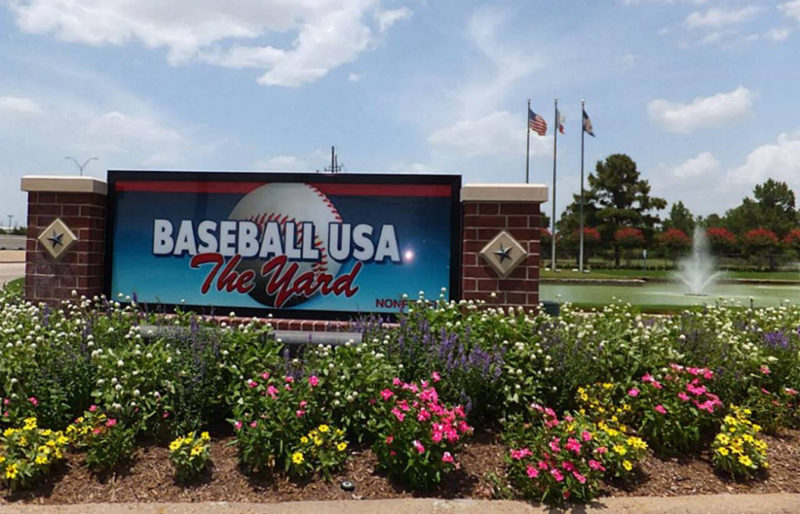 The Indy Pro Showcase will be back for the 7th straight year in Houston at Baseball USA April 21-22 for its second showcase of the season. The showcase comes on the heels of the very successful Ft. Myers Showcase, where 35% of the participants received contract offers. The 2014 Indy Pro Showcase in Houston was an amazing success where over 70% of the attendees got contract offers to play in 5 different independent leagues. The 2013 Houston Indy Pro Showcase included the signing of pitcher Cody Satterwhite who is in “Big League” camp with the New York Mets. “ Houston has been such a fertile ground for us the last 6 years. The talent there is always among the best we see. We can’t wait to go back and start some players on there journey”, said IPS co-founder Nick Belmonte. The Indy Pro Showcase has had many players elected to Baseball America’s Top Ten Indy Prospect List including last year’s Baseball America number one prospect, rhp Eric Anderson. As always, the Indy Pro Showcase is a limited space event so sign up now and reserve your spot to have a chance of starting or continuing your pro career. 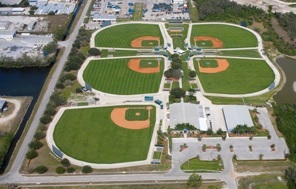 The Indy Pro Showcase which is in its 9th season once again will start getting players jobs at the first showcase of the year February 25-26 in Ft. Myers, Florida. Indy Pro Showcase has gotten over 800 players jobs including Baseball America’s #1 Indy Prospect 3 out of the last 6 years. We are so proud and excited to get these kids a chance and watch them parlay that into professional success”, said IPS co founder Nick Belmonte. “The Frontier League alone had 7 of our former discoveries play in their All Star game last year”, he added. “ We supply that chance that most kids that don’t get drafted or released too early need”, said Dave Marcon IPS co founder. The Indy Pro Showcase does not overcrowd so space is limited. Sign up on the registration page. 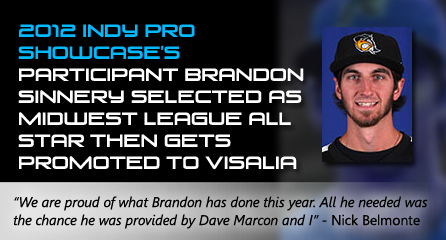 It was announced that Indy Pro Showcase discovery right handed pitcher Eric Anderson was selected by Baseball America as the number one unsigned independent league prospect for the 2014 season. Indy Pro Showcase which has gotten over 1000 players signed in the past 7 years is going back to the Northern California area for the second year in a row. “This area is a fertile ground for talent as we found out last year and is a great place to get a chance to finish out the season with a club for 2014”, said IPS co-founder Nick Belmonte. Among others, the San Jose Showcase last year netted pitchers Kyle Hassna from San Jose State and Robert Ramer from Purdue, both having good years both in 2013 and 2014. It also saw Felician College player Victor Montegudo parlay this showcase into a job as a catcher with the Colorado Rockies. “We know will get kids jobs again from this showcase as it is not too late to finish the 2014 season somewhere.”, Belmonte added. The Showcase will take place at Saratoga High School 20300 Herriman Ave, Saratoga, CA 95070, just outside San Jose. Just a reminder — the St Petersburg Showcase sold out, so don’t delay as the showcases are limited space. The Indy Pro Showcase was created by Nick Belmonte and Dave Marcon to help the players that were not drafted or were not seen by professional scouts to fulfill their dream of playing professional baseball. To find the proverbial “diamond in the rough”. To date, Nick and Dave have helped (signed) over 1,200 players fulfill their dreams. The goal is to find that player that was overlooked and get him playing immediately. In the last three years alone, 9 players discovered through the Indy Pro Showcase have been signed by MLB organizations!